I remember the days when the Crew was a sort of glorified GAP, running in a parallel vein with Banana Republic. Casual and sporty togs with a preppy edge for the college crowd and for low key weekend hijinks. Fisherman sweaters, chinos, and T-shirts in neutral colors were the idea. This is not the J Crew of yore. Old themes certainly persist in the collections which are now infused with posh undertones. 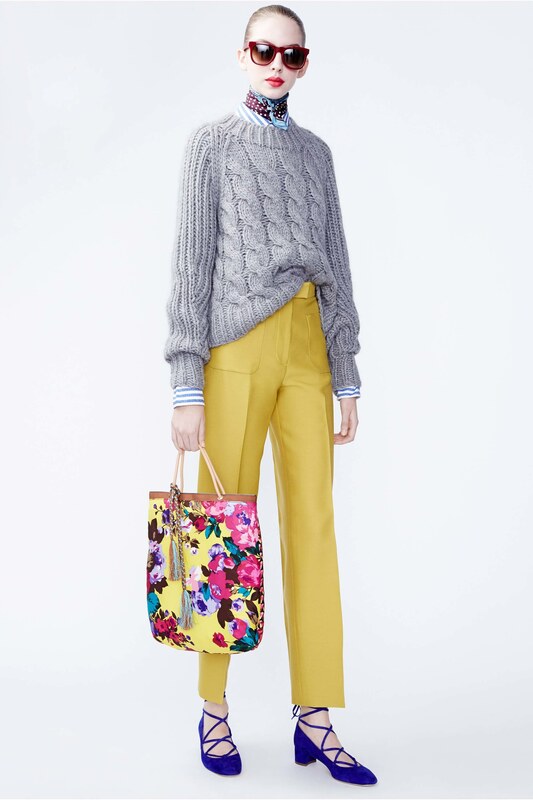 The tried and true FISHERMAN sweaters have made a resurgence (and frankly will always be an in style staple) however have returned in a joyous palette of pastels and saturated hues. Ruffles, the always elegant jacquards, and feline motifs are in the house adding to the hip and chic allure of the still eminently wearable assemblies. 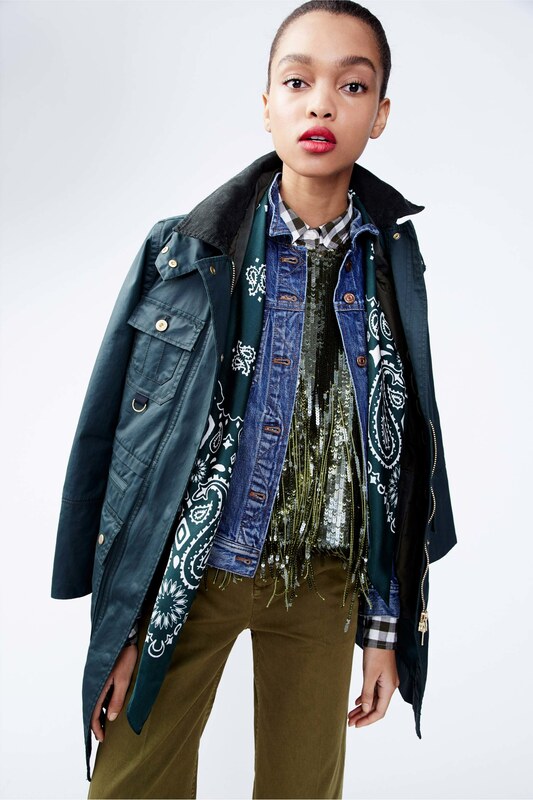 J Crew clearly buys into the "more is better" ethos being embraced on the runways with the mixing of disparate colors and competing patterns, not to mention the commingling of masculine and feminine elements. Whereas the old Crew was pragmatic tending towards the banal, we are now treated to jazz hand theatricality WITHOUT fuss or ostentation. We have old school plaids and tweeds which are now paired with SEQUIINS! The idea is to mix and match to your heart's content, adding whimsy and vibrancy to your wardrobe and life. Your standard khaki parka elevated by the hint of pink collar. And what about those kicky jacquard loafers? Perfect for jeans. 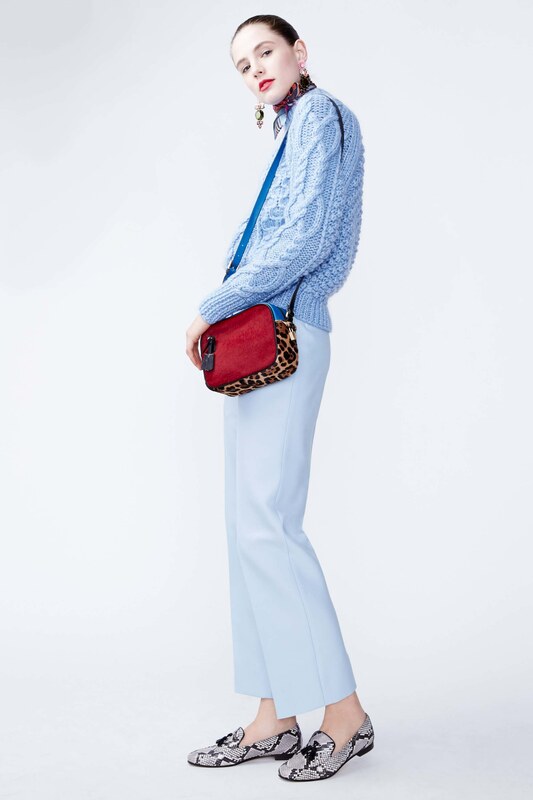 Casual yet feminine and tony with hues of powder blue. Add an Hermes scarf for easy glam. Never be afraid to mix primary and secondary colors (or versions thereof) from the palette, it all makes sense. Consider pink a neutral of sorts, it goes with everything, and adds light femininity to any ensemble. 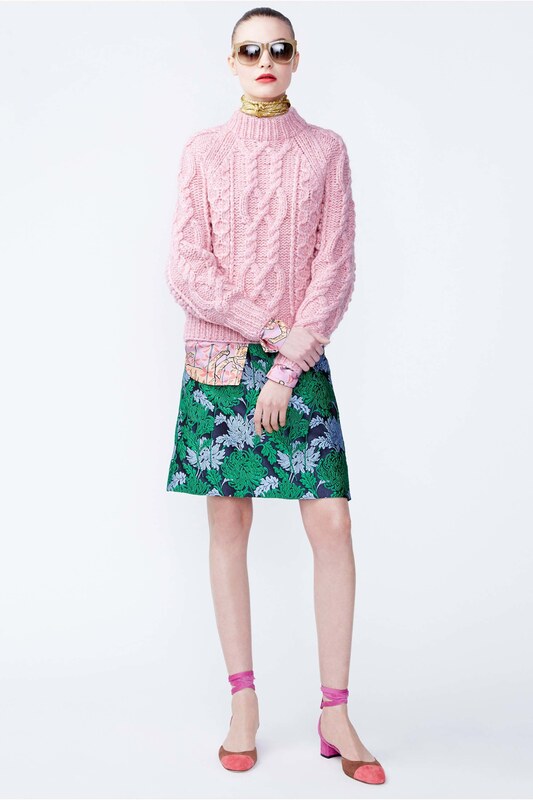 A sweater (of any variety) pairs well with a short skirt, and the fisherman variety provides interesting contrast to the jacquard mini. A good rule of thumb---if you're showing leg, keep the decolletage under wraps. (Unless of course you're gambling in Vegas, then, no holds barred). As a lover of the BIG CATS, I say MIX FELINE MOTIFS AT WILL! 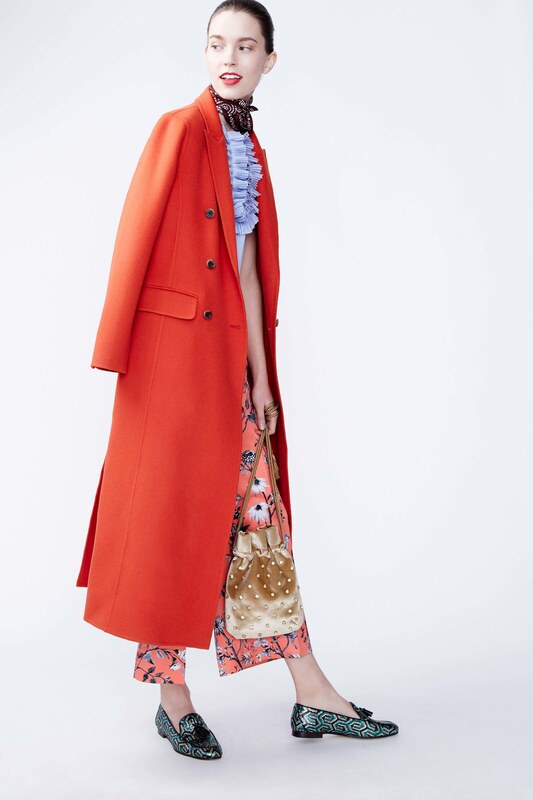 Mixing unexpected colors, patterns, motifs, silhouettes, and fabrications adds curious visual interest to an ensemble. This kind of unorthodox potpourri of elements will engage the brain and put smiles on faces. Of course all the pieces can stand alone. Pair this vibrant skirt with a white poplin shirt and black patent leather flats. A more subdued version of zany. 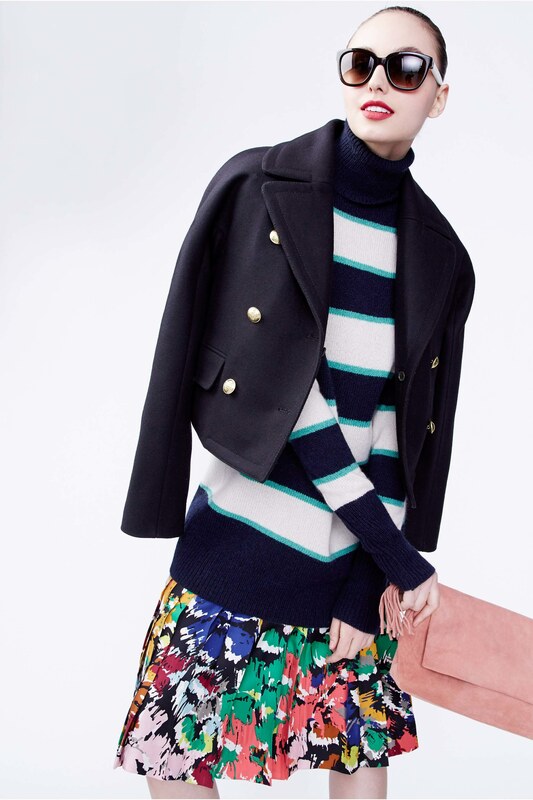 One of my favorites of the lot, what with the glamorous girly floral jacquard skirt, sailor striped top, sea foam cardigan peeking out as a perky adjunct, and of course the iconic trench for good measure. And the Velvet pumps? The cherry on the sundae. For those fearful of excessive vibrancy, just add a pop of color, to an otherwise neutral scheme, via some cerulean blue shoes (and these are beyond adorable) or a tote with bright saturated colors. Temper girly ruffles and such with a more streamlined topper. And then go nuts with the footwear. Two perfect examples of how conservative old school pieces happily coexist with razzmatazz sequined components. You can have wearable whimsy without being a fashion victim. (I'm obsessed by those ballet slipper iterations). MANY colors from the CRAYOLA box are represented in this collection. EMBRACE PINK! Double down on the pastels, why not? Ditch the black suit and go FULL ON FUCHSIA! H U Z Z A H!!!!!! !